Having received a tip from a loyal visitor we visited a cinema in nearby Crawley to view the new Mel Smith directed film 'High Heels and Lowlifes'. We were told that Haywards Heath was not only mentioned in the film but that a full action sequence was shot in the station forecourt. Clearly, this represented a major celebrity connection and needed to be fully substantiated, unlike our Bob Monkhouse connection which is a fabrication based on a conversation overheard several years ago. Given the inclusion of a scene shot in Haywards Heath we were surprised to be 2 of only 4 people to view the film that day. The film is based around a safety deposit box raid and the blackmail of the perpetrators by a nurse (Minie Driver) and a jobbing actress (Mary McCormack) who had overheard the daring raid using mobile phone scanning technology owned by the nurse's conceptual artist boyfriend. The film progressed through mild yet enjoyable comedy moments to its pivotal scenes in and around Haywards Heath. It was at this point that viewers were misled through a combination of the magic of cinema and their own suspension of disbelief. Driver and McCormack had instructed the thieves to perform the 'drop' of the 'swag' at a viaduct just outside Three Bridges station. Regular commuters will recognise this location as the Balcombe viaduct. The first error was the use of a diesel driven locomotive with overly modern carriages in a green livery. The Brighton line has, of course, been electrified for some years and many carriages date back to this original electrification and so are far from modern. They are also yellow. The location for the 'drop' was well chosen in theory however superficial examination of the backdrop revealed that far from using the magnificent Balcombe viaduct, a less grandiose and lower viaduct has been chosen. However, Mr Smith redeemed himself to some extent by featuring a land owning character with an absurd 4wd vehicle. Reeling from this location fantasy our spirits were lifted when the train announcer announced that the train was to pull into Haywards Heath station. We held our breath. McCormack, having high-jacked the above mentioned 4wd vehicle, proceeded to Haywards Heath station to meet sidekick Driver from the train. Driver had been apprehended by the gangsters and was being manhandled off the train. As McCormack raced to Haywards Heath station we began to realise that all was not as we had hoped. 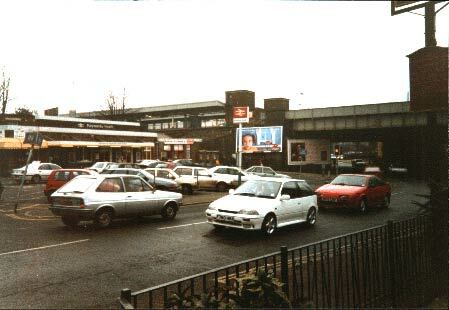 The approach to the station was in fact a semi-village like high street and not the approach either under the bridge or from the commercial square roundabout. The film then cut to an exchange between the gangsters and a smart ticket guard. Not all the guards at Haywards Heath station are smart. The backdrop showed a twee Bluebell railway type station platform more akin to something out of an Enid Bliton novel. We realised at this point that Haywards Heath was not going to be featured in the film at all. Crude background signage attempted to cover up this location illusion with little success. This, however, was not to be the end of the story. As the film cut back to the 'forecourt' of the 'station' to set the stage for a minor shoot-out we were left shocked and appalled. Though we expected not to see the genuine forecourt article we were in fact presented with a gross pastiche. Rather than attempting to represent the Haywards Heath station forecourt with some hint of accuracy the filmmakers simply showed a small station building fronted by a bricked semi-circular driveway with hanging baskets and direct access to what appeared to be a single platform. As the 4wd sped away so did our dreams of seeing Haywards Heath on the silver screen. Whilst we congratulate Mel Smith on his competent direction of this enjoyable caper we remain disappointed that he chose not to shoot his film in Haywards Heath. Even the performances and on-screen chemistry of Driver and McCormack failed to limit the impact of this location blunder. We have written to Mr Smith asking him to clarify the reasoning behind his location choices and its possible effect on tourism in the area.